In the weeks following the U.S. Alumni TIES in Atlanta, Georgia, participants submitted project proposals pertaining to “The New Frontiers of Global Public Health” to compete for small grants of up to $10,000. Spanning local and global efforts, the final 14 proposals represented thoughtful and innovative approaches to public health issues, resulting in a highly competitive selections process. We are pleased to present the six projects selected by the Bureau of Educational and Cultural Affairs of the U.S. Department of State and World Learning to receive funding for this U.S. Alumni TIES grants cycle. Recognizing the power of community and historical awareness, Allie Dyer is awarded a U.S. Alumni TIES Small Grant to implement “Brown Girl Rise” (BGR) in Portland, Oregon with fellow alumna Anna Hayward. BGR will confront the disproportionate population of young girls of color who experience reproductive disease and food insecurity in Portland by providing culturally-inclusive reproductive and nutrition education that illuminates intersections in health, history, culture, race, and gender. Through BGR, girls of color in Portland will have the opportunity to empower themselves and one another in bi-weekly workshops co-developed with youth of the Portland community. The implementation of BGR lays the foundation for giving youth of color an opportunity to lead their communities to cultivate a healthy and just future together. With a focus on breaking the stigma and silence surrounding health issues in Sri Lanka, Trinidad Hernandez is awarded a U.S. Alumni TIES Small Grant for his “Teacher Communication Project for Public Health.” The “Teacher Communication Project” will build an educator development program that provides young Sri Lankan teachers with tools and strategies to promote open communication in both educational institutions and communities about public health issues and the stigma that surrounds them. Partnering with professional Sri Lankan educators and counselors, the “Teacher Communication Project” is rooted in a sensitive approach to challenging cultural norms, and equips young educators with the information and support to be promoters of good public health in their institutions and communities. Jim Mancini is awarded a U.S. Alumni TIES Small Grant for his “Video Production to Open Minds and Doors to Welcome Inclusion,” with the aim to address issues of misunderstanding and exclusion for people with intellectual, social, and behavioral differences in Seattle, Washington. In a unique approach to improve awareness specifically for people with autism spectrum disorder (ASD), the “Video Production to Open Minds and Doors” will transcend existing intervention efforts that support skill acquisition and community integration for individuals with ASD by instead aiming to educate the communities in which they live to be more welcoming and inclusive. With brief public awareness videos, the “Video Production to Open Minds and Doors” will aim to facilitate community change and promote a world of inclusion for people with intellectual, social, and behavioral differences and their families. Emily Morgan is awarded a U.S. Alumni TIES Small Grant to implement “Participatory Development of a Community Food Resource Guide for International Newcomers in Ithaca, NY” with fellow alumna Sana Malik for identifying barriers to food-related resources for international newcomers. The project will leverage existing community assets in Ithaca to develop a local food resource guide tailored to the needs of international newcomers largely through asset mapping, which will include interviews, focus groups, and participatory workshops to help inventory resources that contribute to food and nutrition security in Ithaca’s international community. In continuing collaboration with the community and its unique strengths, the resulting Community Food Resource Guide for International Newcomers will be refined by members of the international community in Ithaca, and finally launched at a community event celebrating the integration of the guide with the non-profit organization Ithaca Welcomes Refugees. In response to high rates of injury, death during childbirth, and complications from infectious disease in rural regions of Zambia, Jenn Pigoga is awarded a U.S. Alumni TIES Small Grant for her project, “Developing a Context-Appropriate Model for the Zambian Emergency First Aid Responder Program (EFAR).” As a remodeling of the existing EFAR program, the project aims to improve the relevance and sustainability of emergency care services in rural Zambia by empowering local Zambians to train their community members to respond to basic emergencies in the absence of a formal emergency care system. The innovative and community-inclusive model promises to provide an approach to emergency care services that is translatable across other developing regions, allowing community members to educate themselves and one another in culturally relevant contexts. With fellow alumna Kim Walsh-Childers, Amy Tran is awarded a U.S. Alumni TIES Small Grant for her community-based retreat, “I’m With You: Empowering Young AAPI Women to Stop Sexual Violence” in St. Cloud, Minnesota. Taking form as a retreat for young Asian American Pacific Islander (AAPI) women, “I’m With You” will empower AAPI women to combat disproportionate rates of sexual assault by overcoming community stigma toward discussing sexual health and opening a forum for sexual health education. The retreat will include education sessions focusing on violence prevention, leadership development, and the intersection of racial identity and gender in the AAPI community. The project will conclude with a participant reunion, providing additional strategies to combat sexual violence and solidifying the personal and community growth gained from the intensive “I’m With You” weekend retreat. The Bureau of Educational and Cultural Affairs of the U.S. Department of State and World Learning congratulate these award recipients and applaud the alumni who submitted creative and competitive project proposals for consideration. 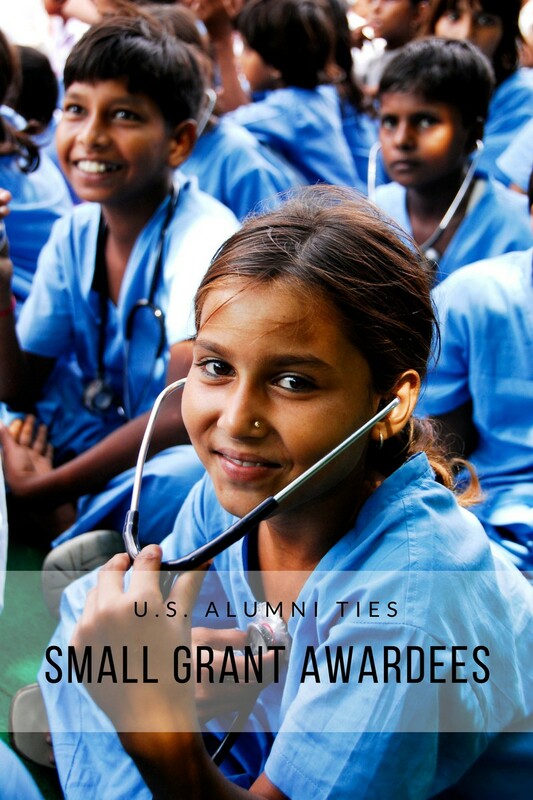 As these alumni implement their innovative project ideas, their progress and accomplishments will continue to be featured on the U.S. Alumni TIES Medium blog. Alumni Thematic International Exchange Seminars (Alumni TIES) are regionally focused seminars for alumni of U.S. government-sponsored exchange programs.